I chanced up EverythingKawaii E-store's New Year "Mine" sale on cosmetics so I was able to purchase a haul. I don't usually do this: buying a set of make ups and all that. 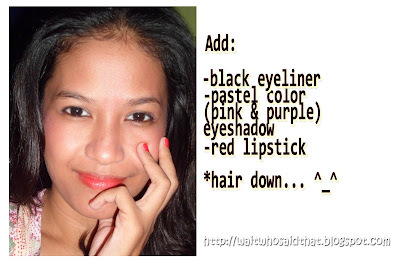 I had always been the pressed powder, blush on, eyeliner, lip tint or lip gloss chic... well... there's always room for improvement, thus, my first ever - not really a how to - rather, simply sharing what my everyday look for 2012 will be post. 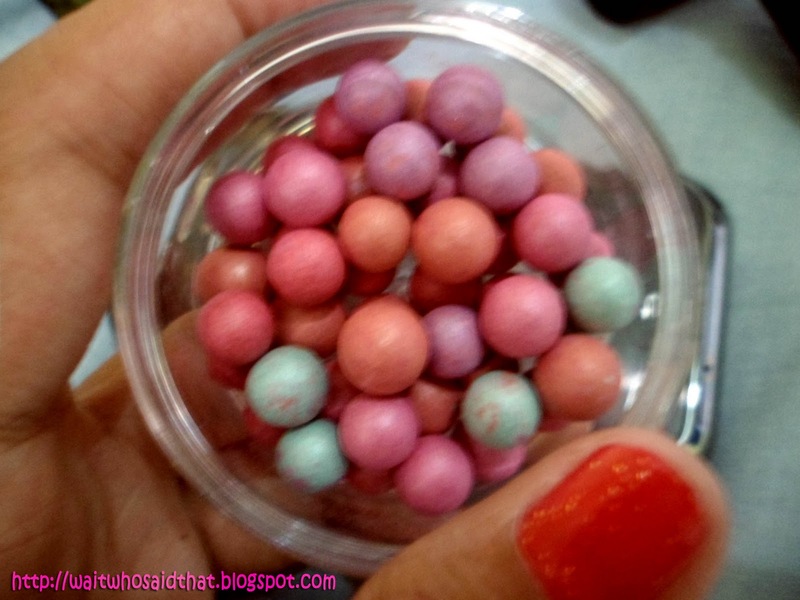 In this post however, our focus is on these adorable, cute looking, MAC Ball Blushers. Anyway, this color (pastel glow) works better as a highlighter all over the cheeks and the face than a blush on. But for simple looks, you can actually make it work on its own. 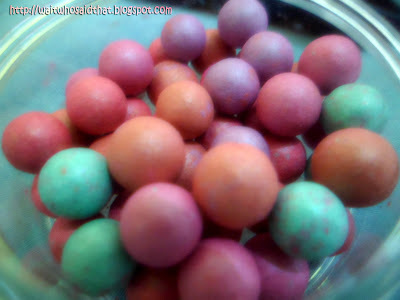 Lovely colorful pastel powder pellets. 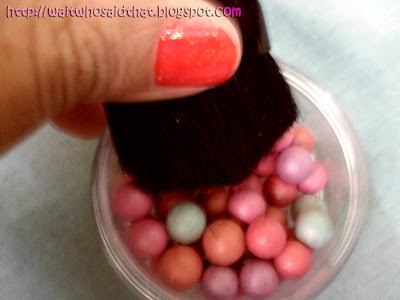 Now, what you do is swirl the brush around inside the container, and hopefully you get a nice mix of all the colors to get the highlight or blush that you want for your cheeks. For someone with my skin tone (fair to dark), you'll notice that the colors turns a little light and doesn't easily show. 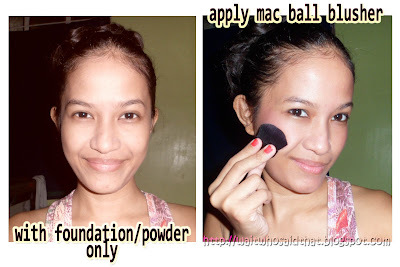 You'll have to put either a little more amount of it, or you can just add a darker shade of blush on, and then use the MAC ball blusher as highlight. and then feel free to apply the MAC ball blusher. And then I put on the usual black eyeliner, a little pink and purple eyeshadow on the eyelids and on the corner of my eye... match it up with red lipstick that matches my nail polish... placed my hair down, and voila! A nice, light, could pass for an everyday look. Now, the problem is... where do I go now??? Good treat for yourself sissy! :). I didn't buy a makeup set for the holiday season. Thank goodness a friend who just got home from Chicago brought me a haul :P, Merry ang christmas! 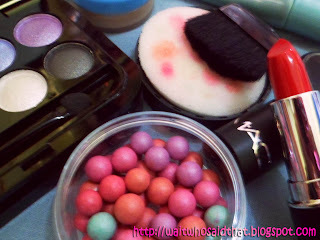 I have Ball blusher too but that one from Sophie and I must say it's fun using them. You are looking great! 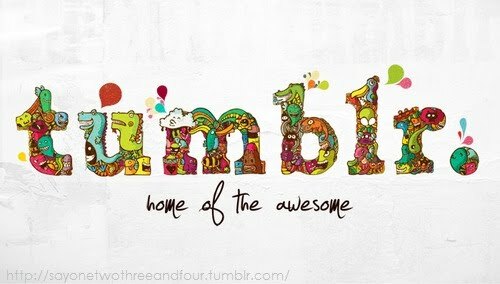 Thanks for the share :). that's a new online store i can visit. thanks for sharing! I hope you don't mind my saying. :( I just didnt want you to have the same experience as me. Don't approv na lang my comment if you don't want. @Mich: oh no i don't mind at all.. failed to include in the post that this isn't authentic US MAC.. or whatever.. they say it's singapore, or something. either way, i knew it wasn't because of the price. very cheap. but.. since i'm on an experimental mood, this works somehow. and they really are cute. haha.. thanks for the heads up! You look gorgeous darling. It's perfect for your skintone.